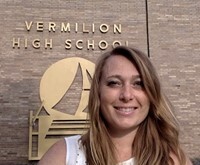 Vermilion High School is excited to welcome Mrs. Jennifer Bengele back to VHS after a year’s absence. Mrs. Bengele came to VHS as a Science teacher in 2001. Throughout her career in Vermilion she taught Science at both VHS and SMS, and served the district as department head, team leader, mentor for new teachers, and ski club coach. In 2015 Mrs. Bengele was asked to accept a leadership role as Technology Coach for the district’s teaching staff. In this position she worked with teachers to find new ways to integrate technology into their lesson plans. She also developed professional development courses for her colleagues, and continues to teach those courses through Ashland University. Mrs. Bengele graduated from Baldwin Wallace College in 1999 and earned her Master’s degree from there in 2002. She holds Ohio licenses as both a Science teacher and Principal.